Robin Corey Books, 9780307931436, 26pp. 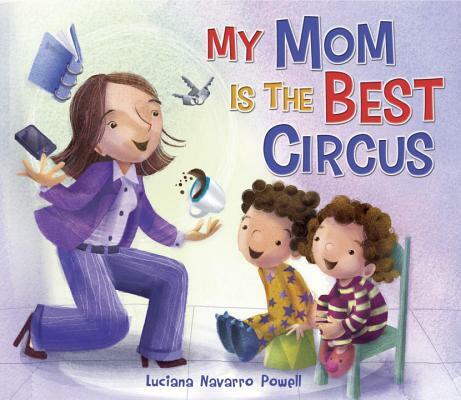 This humorous story celebrates mom as the best one-woman show on earth as she juggles everything that goes on during the day she's a ringmaster, a wild beast tamer, a magician, and sometimes a clown. But her best stunt of all is the sandman show, when it's time for a good-night story. Luciana Navarro Powell's colorful, humorous illustrations are a perfect complement to her spirited, rhyming text. LUCIANA NAVARRO-POWELL is an illustrator, designer, busy mother of two very young children, and wife of a playful guy. She has illustrated several books for children, and wrote and illustrated"My Dad Is the Best Playground, "a companion to this book. She lives in San Diego, California."